A flea market buyer in Virginia saw a painting and simply loved the frame. She bought the painting for $50. She got home and began to rip the painting from the frame when her mother stopped her. You guessed it. 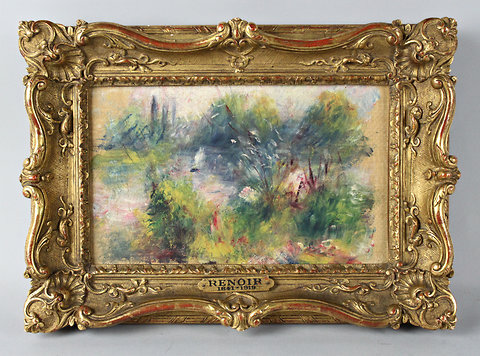 The 5” by 9” painting was a Renoir, allegedly painted on a linen napkin for his lover, with a current pre-sale estimate of $75k! Mothers have the sixth sense for fine art, don’t they? If only that was the end of the story. Publicity for the auction sale triggered claims that the painting was stolen from the Baltimore Museum of Art in 1951. There is evidence that the painting was delivered on loan to the museum in 1937. An insurance company paid a $2,500 claim after the theft. Talk about reaching back in time to determine title and provenance. No claims were filed with the Art Loss Register. The events occurred so long ago that probably no one cared anymore by the time the Art Loss Register was established in 1991, or even by the time its precursor, the International Foundation for Art Research was founded in 1976. The insurance company paid the claim and all involved had likely forgotten about the matter. Till now. So, who owns the painting now? The museum? The owner who consigned to the museum? The insurance company? The flea market purchaser? Stay tuned.